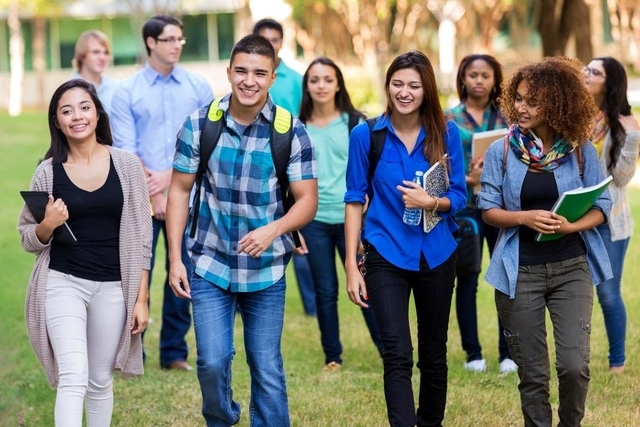 It is well known that the USA has the reputation of having the best universities in the world and is one of the many reasons why people from all over the world want to go to this country, however, getting to study in the USA for international students is not as easy as it seems. In this article we want to help you in your search to know in depth the different universities and how true is the quality of the education in the USA, as well as the fundamental requirements that you must fulfill to be able to aspire to enter this country, so that you evaluate in an effective way your concerns and doubts in everything that refers to which universities are the best in the USA or why to choose the USA from all the other countries. Having access to a country that is mostly known as the mecca of technology, cultural diversity, thoughts and religions is one of the many benefits that you can have and will ever experience. To have a wider view of the world which gives a feeling of satisfaction since the moment you manage to be a part of it. We will give you a broader view of the best universities in the USA, the quality of the education we have been referring to, and the other many extra benefits that we can derive from this experience. The United States is one of the world’s most educational countries; its 50 states allow a number of possibilities to live great experiences. 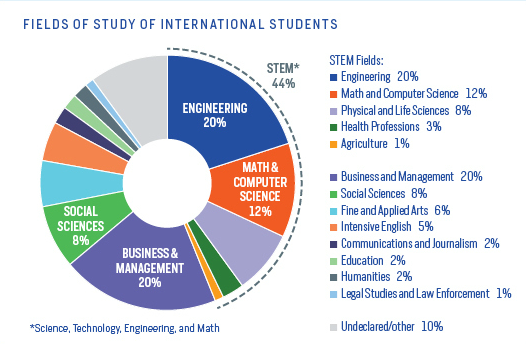 The United States offers international students a dynamic system with broad options of projection in the world of work plus 46 of the top 100 universities in the world are American. The US-based Institute for International Education provided new numbers that show foreign internship growth of 5.7 percent for the 2011/12 school year; of which 23 percent is due to Chinese students. The most important change is attributed to Saudi Arabia, whose students got up to 50 percent; possibly as a result of what happened during the so-called “Arab Spring”. You can take a look further into this study by visiting the official Institute of International Education on IIE Open Doors Data 2016. Even though it has one of the tiniest student populations, CalTech has an impressive number of successful graduates and affiliates, including 34 Nobel prize winners, six Turing Award winners, five Fields Medalists and a number of national awards. Based right next to Silicon Valley, Stanford has had a prominent role in encouraging the high-tech industry to develop in the area. Many faculty members, students, and alumni have founded successful technology companies and start-ups, including Google, Snapchat, and Hewlett-Packard. A long-standing rival of Cal-Tech, MIT also cultivates a strong entrepreneurial culture, which has seen many alumni found notable companies such as Intel and Dropbox. Unusually, the undergraduate and postgraduate programs at MIT are not wholly separate; many courses can be taken at either level. Harvard University is probably the best-known university in the world, coming top in the ranking most years. It was founded in 1636 and is the oldest higher education institution in the US. There are currently 20,152 students enrolled, a quarter of whom are international. Although the cost of tuition is expensive, Harvard’s financial endowment allows for plenty of financial aid for students. Like Harvard, Princeton is a prestigious Ivy League university with a history stretching back more than 200 years. You can take a look at the following Ranking by the Forbes of the best universities in the US. The United States ranks first in the list of the 50 best education systems by country in the ranking provided by Universities in 2014. If you want to study and work in the United States, you first have to know, Americans invest a lot in higher education In general and per student. This is the country with one of the best-qualified labor forces and is ranked fifth overall and have one of the best employability rates among their graduates. The first step for a prospective student is to be accepted for enrollment in an established school being a University or College, most academic students, including those in language training, will have to comply with the minimum requirements set by the government. If you are applying for a student Visa from your home country, you will begin, selecting a school in the USA where you want to study and apply. If your application is accepted you surely will get an answer from the Designated School Official and must pay the receipt. Pass those steps and you will be given an individual ID number. After the school enters your information into the database, you will receive a new form and schedule the “Initial Entry Visa Interview” with your local U.S. Embassy or Consulate. Check with your U.S. Embassy or Consulate to determine your policies, procedures and other requirements for American universities. Once you are granted a U.S. entrance visa, notify the school of your expected arrival date, and obtain a new form if the dates have been deferred. Upon arrival at the United States Port of Entry you must present Your Form signed by the DSO of the school you will attend, more important, a valid visa containing your identification number and the name of the school you will be attending, plus the financial documentation as well such a valid passport. US colleges and universities admit international students because they contribute to campus diversity and help sustain the academic programs, according to Peggy Blumenthal of the Institute of International Education. Everyone agrees that students from different cultures enrich the many discussions that have a place in the classroom. No one is surprised that the largest universities admit the largest number of foreign students. When students have a positive experience and have it in their home countries, others join them. Studying abroad gives you a life experience that makes you bi-cultural. Two years of living with students from all over the world open your mind and prepare you to work in an international environment and be attentive to cultural difference. Explain your reasons and why you want to go into the course referring to how are you right for the course so that you can be able to demonstrate also that you’ve researched the course or profession and understand what studying in America will involve in order to your scholarship can get accepted. However, you must not forget to explain what you do outside the classroom, or, your extracurricular activities. If you’re able to explain why it’s relevant to your course, try to reflect them on your own experiences, explaining what you have learned from them or how they help you before. Other tips on this personal statement writing help will be that you can demonstrate your skills, but please be truthful; therefore, you have to think about which ones relate most readily to the course you’re applying to. Then demonstrate how you’ve developed truly are, used and continued to strengthen these. Don’t be afraid to show off that you are a critical thinker but be conscious. University is all about being able to think independently and analytically so being able to demonstrate that you are working like this, it’s already a big plus point. Explain a long term plan and don´t forget to mention what your goals are if you can do it in an interesting way and you had to have a specific path in mind. And last but not least, always have a positive state of mind to every that concerns to your apply. Take a look at the following website from Standford University that explains what a proper Personal Statement should be about. How I can imagine all the universities build a picture of you as a student from all the different information you provide them if you still want a personal statement writing help, to decide whether or not to offer you a place. The picture is made up of several different pieces: your Princeton undergraduate personal statement, for example, academic record, predicted A-level grades (or equivalent), and your teacher’s reference. For most courses, for example, you will also need to take an admissions test or submit written work as well. If your application is short, your interview will also be taken into account. This means that your personal statement is important but it’s not everything: it is just one little part of the overall picture to a transfer student to get an education in the USA. They are more interested in your academic ability and potential. They want to see that you are really committed to the subject or you want to study at university but it is not enough just to say that you have a well known passion for something, you need to show tutors how you have engaged with your subject, above and beyond whatever you have studied at school or college. This includes any relevant extracurricular activities. 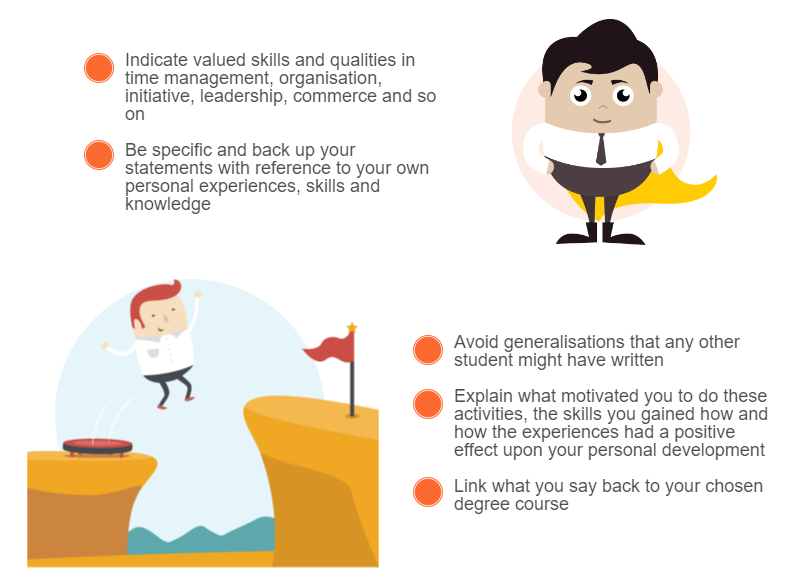 Try to avoid writing your personal statement as you are ticking things off the list. There is no checklist of required achievements, and tutors will not just scan what you have written to look for keywords or phrases. If you have decided to apply for an internship in the USA as an international student, it is highly important that you have known how to write a personal statement for undergraduate admission stand out. However, writing an American university or NUS admission personal statement may not be one of the easiest things to do, so it is important that you follow our recommendations if you want to achieve better results. For example, when you apply for a scholarship, there are not better chances of being accepted and given the opportunity than writing a perfect personal statement. But if you’re finding it too difficult, don’t hesitate to contact us and we will offer you our best personal statement help for those who want to study in the US for international students!